If you're interested in studying business, check out these top business schools first. Each has impressive facilities, professors, and name recognition. I've listed the schools alphabetically to avoid the arbitrary distinctions often used to decide who should be number 7 or 8 in a top ten list. That said, the Wharton School at the University of Pennsylvania consistently claims the top spot in national rankings. Even if you're not 100% sure that business is right for you, realize that all of these programs are at large universities where you can change majors fairly easily. In fact, some of these schools require students to take a year of liberal arts and sciences courses before admission to the business program. If you're thinking of going on for an MBA, also know that an undergraduate business degree is by no means a prerequisite. The critical thinking, writing and math skills at the heart of a liberal arts education can serve you just as well, if not better, than a more narrow pre-professional degree. Located in Ithaca, New York, Cornell University has several excellent options for undergraduates interested in business and management, and the university frequently places high on rankings of undergraduate business programs. Students can choose from the Dyson School of Applied Economics and Management, the School of Hotel Management, and the School of Industrial and Labor Relations. The Dyson School is housed within the College of Agriculture and Life Sciences. Both Dyson and ILR are part of Cornell's state-funded unit, so tuition will be lower than it is for the School of Hotel Management. Prospective students need to designate which school they are applying to on their applications. Hotel Management is generally thought to be the best program of its type in the country. Cornell is part of the Ivy League, and it frequently ranks among the top universities in the country. The Goizueta School of Business gets its name from Roberto Goizueta, former president of the Coca-Cola Company. The school is on Emory's main campus in the metropolitan Atlanta area. This highly-ranked school offers its students exchange opportunities with the Cass School of Business in London. The Goizueta curriculum builds upon a two-year liberal arts and sciences foundation. Students, both transfers and from within Emory, can apply only when they have attained junior standing. A minimum of a B+ average in pre-business courses is required for admission. The Sloan School of Management, located on the Charles River in Cambridge, frequently finds itself on top-ten lists of undergraduate business schools. The Sloan School offers bachelor's, master's and doctoral degrees, and undergraduates can often take classes with graduate students. There is no separate admissions process for the Sloan School—students who have been accepted to MIT simply declare Management Science as their major at the end of freshman year. In 2008, MIT launched a new minor in Management Science. The mathematically-challenged should think twice before considering Sloan—the school has an unusually strong emphasis on quantitative analysis. Located in Greenwich Village in Manhattan, New York University's Leonard N. Stern School of Business is a great choice for the ambitious student who wants a top program in a bustling urban environment. The Stern School of Business is highly competitive with a significantly lower rate of acceptance than NYU as a whole. Unlike some other undergraduate business programs, the Stern School is a four-year curriculum -- students must indicate their interest in business on their initial application to NYU. Berkeley's Walter A. Haas School of Business, like the other public schools on this list, offers a top-quality undergraduate business program at a bargain price. Haas has a two-year curriculum, and students must apply to the school from within Berkeley. In 2011, roughly half of the Berkeley students who applied to Haas were offered admission. On average, accepted students had an undergraduate GPA of 3.69. The Haas School is located on Berkeley's main campus in Berkeley, California. The Stephen M. Ross School of Business at the University of Michigan frequently places in the top half of top-ten rakings of U.S. business schools. The school's success has led to the building of a new 270,000 square foot home for Ross. The Ross School has a three-year curriculum, so most students apply during their first year at Michigan. On average, accepted students for the fall of 2011 had a GPA of 3.63. Exceptional high school students can apply to Haas through the "preferred admission" process. If accepted, these students are guaranteed a place in the Ross School of Business if they fulfill certain requirements during their first year of college. Only 19% of preferred admission applicants were accepted for the fall of 2011. The Kenan-Flagler Business School at the University of North Carolina has the lowest price tag of all the schools on this list. Since 1997 the school has occupied an impressive 191,000 square foot building on the Chapel Hill campus. Students apply to Kenan-Flagler after their first year at UNC Chapel Hill, and transfer students must apply to UNC first. For the class of 2011, 330 applicants were admitted and 236 were denied. The average GPA of admitted students was a 3.56. 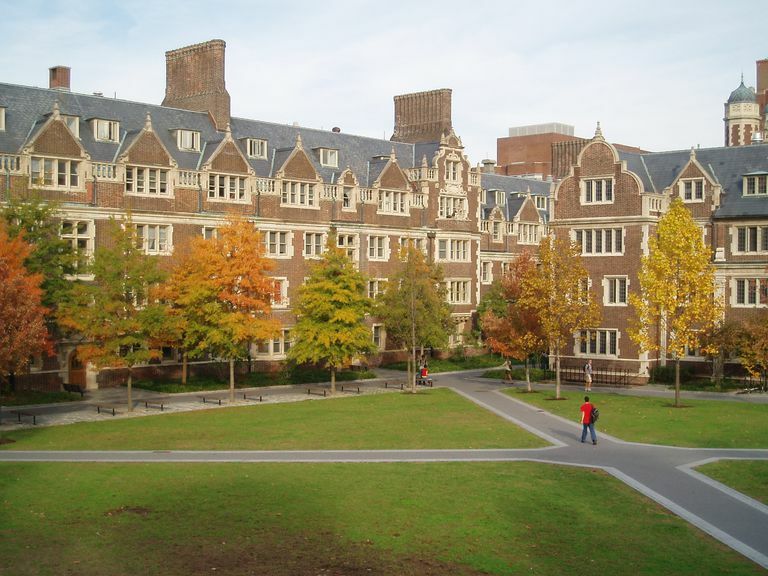 The Wharton School at the University of Pennsylvania almost always ranks as the top undergraduate business school in the country, if not the world. The school's website claims the faculty are the most published and cited business school faculty in the world, and Wharton boasts an impressive 8 to 1 student / faculty ratio. The undergraduate program typically receives about 5,500 applications a year of which about 650 are admitted. The school is a four-year program, so students apply directly from high school. Median starting salaries for Wharton graduates are second only to MIT's Sloan School of Business. McCombs is yet another excellent business school at a state university, and its undergraduate program nearly always wins high marks in national rankings. The accounting major is particularly strong. Most McCombs students apply straight from high school, and the admissions standards are higher than for UT Austin as a whole. For the class entering in 2011, 6,157 applicants applied and only 1,436 were admitted. Students can transfer to McCombs from another college at UT Austin, but the odds of getting in are low. Also, because the school is state supported, most spaces are reserved for Texas residents. The admissions bar is thus even higher for out-of-state applicants. In 2011, Business Week ranked McIntire #2 among undergraduate business schools, and the in-state tuition is 1/4 the cost of typical private universities. The school recently moved to state-of-the-art Rouss Hall on UVA's beautiful Charlottesville campus in Jeffersonian Virginia. McIntire's undergraduate curriculum requires two years, so students typically apply in the spring of their second year at University of Virginia. The 2011 entering class had a mean GPA of 3.62, and 67% of applicants were admitted. McIntire also accepts transfer students from outside of UVA if they have the requisite course work and qualifications.